Normally I’m annoyed when one of my sons tells me what he’s “going to have for dinner” before lunch time has even passed. 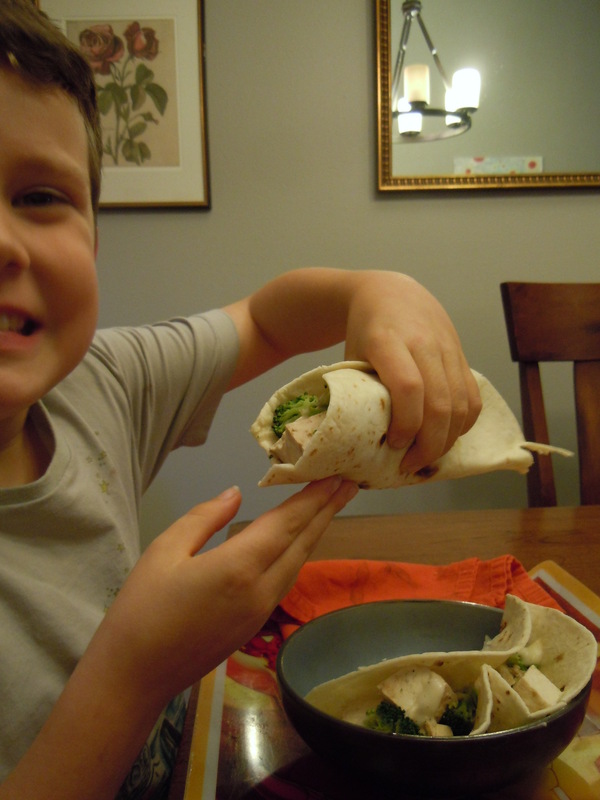 Today though, I let it go because what my oldest ‘ordered’ happens to be my favorite thing to give him, a broccoli and tofu wrap. It’s easy, healthy, and the fact my son gets excited for it leaves me smiling no matter what kind of day it’s been. (And it actually hasn’t been a very pleasant day.) Here’s the basic recipe: lightly steam cut-up broccoli and cubed tofu with a bit of balsamic vinegar, (gluten-free) soy sauce, and a turn or two of cracked pepper. Pile that into a couple of warm tortillas, corn if gluten intolerant of course but my son’s favorite are spelt. Add some garlic sauce on top and enjoy. I usually steam more than I need of the broccoli and tofu and keep it in the fridge for warming up the next day~ it works well, plus the mixture can always end up on rice instead if that sounds better. Great weekday recipe. Awesome! Keep that good nutrition going as long as you can. When they get older…….they may depart for awhile, but I promise you that they always come back when there is such a good foundation. Hooray for mommies who provide nutritious meals! Thanks! There’s nothing more fulfilling that watching one of my boys eat some veggies :0).